Demonstrated exceptional creativity in Computational Fluid Dynamics (CFD), Finite Element Analysis (FEA) and composite material analysis for aerospace applications. Proven computer programming ability using Microsoft Visual Basic, FORTRAN and C++. Not just theoretical but "real world" experience in subsonic, supersonic and hypersonic wind tunnel testing and related CFD analysis and experiments. Highly experienced in the industrial use of sophisticated numerical analysis techniques to enhance productivity and reduce final product cost. Aerodynamics, structures, materials, applied mechanics and space propulsion. Also, Computational Fluid Dynamics (CFD), wind tunnel testing, Finite Element Analysis (FEA), General Relativity, quantum mechanics, particle physics and composite materials analysis & design. AeroRocket provides wind tunnel testing for the determination of LIFT (CL) and DRAG (CD) coefficients for almost any aerodynamic shape using its own subsonic wind tunnel. The wind tunnel at AeroRocket's disposal was developed in-house to provide a wide range of lift, drag, velocity and pressure profile measurements for any shape imaginable. The test section is 7 inches wide x 10 inches high x 16 inches long. Maximum test section velocity is 80 ft/sec without a test item installed. 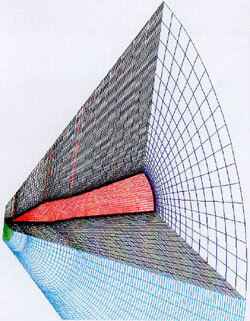 The AeroRocket wind tunnel is ideal for measuring the subsonic drag of unusual designs and shapes not treated by AeroDRAG™ or other rocket analysis computer programs until the development of AeroCFD®. The AeroRocket subsonic wind tunnel is ideal for measuring drag and lift using the in-house built two-component force balance system. The AeroRocket subsonic wind tunnel is routinely used for defining the aerodynamic properties of new designs and for validating the design of vehicles like the Schafer Corporation ultra-high altitude V-Ship. AeroRocket's new supersonic blow-down wind tunnel having an inside-diameter of 1.03 inches and Mach 3 capability is operational and being used to design the HFV-3X spacecraft for transonic and supersonic flow. In addition, John Cipolla's unique expertise in the fabrication of miniature supersonic wind tunnel models allows testing realistic shapes for accurate flow field and CD measurements for a wide variety of R&D applications, including the HFV-3X and other supersonic designs. Primary Aerospace design engineer for the 800 foot long Aeroballistic Research Facility, also known as the ARF, located at Eglin AFB. Florida. As primary mechanical designer of the ARF, responsible for design, fabrication and installation for dozens of major components. Designed complex free-flight instrumentation used to measure subsonic and supersonic projectile position, velocity, stability derivatives (CNa, CMa) and aerodynamic coefficients (Xcp, Cd, CL). Free-flight tests conducted in the ARF are used to validate innovative high speed projectile designs and related CFD results. The ARF engineering design effort continues to have a direct positive impact on many Army, USAF and NASA projects. Successfully utilized the ARF test facility to publish papers concerning the Interferometric prediction and validation of air density flow field distribution of a cone-cylinder-flare projectile in free-flight and the CFD analysis of missile configurations in supersonic flight. Many USAF personnel use the ARF to publish research papers sponsored by the AIAA and to support their Phd thesis research. CFD EXPERIENCE: Project manager and principal developer of new Computational Fluid Dynamics and high power rocket analysis computer software. Developed AeroCFD® for the compressible fluid flow analysis of model and high power rockets. AeroCFD® is a three-dimensional axisymmetric and two-dimensional finite-volume numerical analysis computer program that solves the steady and unsteady inviscid Euler equations for subsonic, transonic, and supersonic flow. AeroCFD® generates flow fields by applying automatic numerical grid generation and mesh distribution around a library of standard aerodynamic shapes. Complex CFD solutions are achieved in minutes rather than hours greatly increasing aerodynamic design productivity. PROPULSION EXPERIENCE: Developed AeroIsp™ an affordable program for the generation of thrust-time predictions for new solid fuel rocket motors and curve-fit analyses of new rocket propellants. Developed several other software applications for the analysis of model rocket, high power rocket and professional (full-scale) rocket aerodynamics. Specifically, developed Nozzle and AeroSpike for the performance analysis of standard nozzles and the next generation aerospike rocket motors. 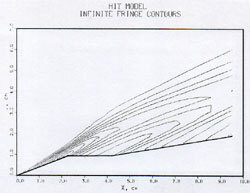 For the Strategic Defense Initiative (SDI) developed the first magnetic field finite element analysis (FEA) computer program for determining the internal and external forces experienced by electro-magnetically (EM) propelled hypervelocity projectiles. Later, other companies developed similar magnetic field finite element analysis capability, but John Cipolla's magnetic field finite element analysis was the first available at Eglin AFB for modeling electro-magnetically launched hypervelocity projectiles. FLUENT and GAMBIT used to solve complex 3-dimensional turbulent fluid flows in process control valves. Using Fluent CFD John Cipolla invented an innovative valve trim or insert capable of controlling cavitation and reducing valve induced noise level by several dB. 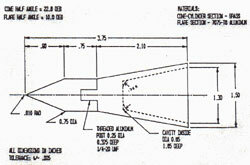 This new valve insert design was made possible because John Cipolla was able to draw upon previous aerospace experience where similar methods and devices are used to reduce sound pressure level in aircraft open bomb bays when operating in the transonic, supersonic and hypersonic environment. --Software development for new grid generation and CFD flow solver algorithms. --Project manager for a USAF project to analyze separation of bodies in hypersonic flow. --Developed methods to model high-temperature equilibrium flows for hypersonic vehicles. --Program management of new CFD program code development at Wright Laboratory. --Aeroelastic and structural analyses of F-15, F-16, A-10 and B-52 aircraft/weapon compatibility. 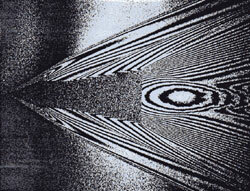 --Participated in the development of electro-magnetically (EM) launched projectiles for SDI. --Aerodynamics and structural analyses for the AMRAAM air-to-air missile. --Developed 3-D multi-block missile CFD model using the CRAY-2 super computer. --Developed a fully viscous cavity flow CFD simulation of a fighter aircraft open bomb bay. --Predicted total missile drag and free flight static stability derivatives using EAGLE CFD code. --Validated the Eagle CFD code, theoretical basis of the AFSEO Beggar CFD code, used by the United States Air Force SEEK EAGLE Office to conduct time accurate store separation analyses. Experienced in the industrial use of sophisticated Finite Element Analysis (FEA) methods to enhance productivity and reduce final product cost. This valuable experience has been in the areas of static and dynamic analyses using MSC/NASTRAN and COSMOS/M finite element analysis software. Developed and coded several FEA computer programs for USAF in-house use in the areas of structural analysis, fluid dynamics and electromagnetic and magnetic fields. Experience using AutoCAD and ProEngineer computer aided design software for sophisticated design efforts. Finally, solid experience using PDEase2D for the analysis of field problems in structural mechanics and fluid dynamics. STRUCTURAL ANALYSIS: Performed complex structural and aeroelastic analyses of USAF aircraft/store compatibility for flight test certification. Planed and performed engineering studies for the design and flight test of weapons being procured by the Air Force Materiel Command. Incorporated several new armament and launcher combinations into the F-15 and F-16 aircraft flutter simulations. This work required in-depth knowledge of MSC/NASTRAN to perform aeroelastic and flutter simulations of the F-111, F-15 and F-16 aircraft. During Desert Storm, certified the GBU-28 laser guided super bomb called the "Bunker Buster" for carriage aboard the F-111 and F-15 aircraft. Finally, for the Strategic Defense Initiative (SDI) analyzed the dynamic response of EM launched kinetic kill vehicles (KKV) accelerated to 100,000 G's. MSC/NASTRAN and classical stress analyses used to determine Von Mises stress levels in the projectile airframe during electro-magnetic rail gun launch. COMPOSITE MATERIALS: While working for the USAF developed the algorithm and matrix equation solution for the in-house paper, "Aeroelastic Analysis of a Forward-Swept Wing with Stiffness Cross-Coupling". This analysis made possible the rapid parametric design of composite material forward-swept wings. Also, experienced in the theoretical analysis of aerospace structures that use composite materials for stiffness cross-coupling like forward-swept wings, composite shells and single-piece filament-wound graphite epoxy casings for solid fuel rocket motors. Developed methods to model carbon-carbon composite material nose cone ablation for EM launched SDI projectiles. Also, performed a finite element structural analysis for an early GBU-15 composite-wing transonic de-lamination problem. PIEZOELECTRIC MATERIALS (ACOUSTICS): While working for Raytheon developed a FORTRAN-77 based computer program for the design of underwater sonar transducers. PESAP (Piezo-Electric Structural Analysis Program) incorporated an electrodynamic piezoelectric finite element in addition to the standard constant strain finite element. PESAP successfully predicted resonance frequency, modal patterns, input electrical admittance verses frequency and modal displacements for several U.S. Navy underwater sonar transducers. PESAP more accurately modeled the interaction between complex modes of vibration and the acoustic environment than other methods that were available. John Cipolla is performing innovative research in the area of warp drive technology for faster than light star travel. The image to the left shows a spacecraft being propelled while enclosed within an artificially generated warp bubble. A warp bubble based on the concepts of General Relativity uses opposing regions of expanding and contracting spacetime for propelling a starship at velocities exceeding the speed of light. This is a work in progress based on a new method for warping spacetime to generate warp bubble disturbances without the need for exotic matter or negative energy. Self-employed aerospace engineer and computer programmer. Deeply involved in desktop publishing for the Internet and the application of computer programs for producing high impact graphics and animations for e-commerce web pages. Extensive experience using UNIX, Microsoft Windows and Macintosh operating systems. --CFD code development using FORTRAN-77. --Developed AeroDRAG™ to compute rocket drag to Mach 20. --Developed CFD applications for high speed rockets: HyperCFD™ and AeroCFD®. --Experienced in industrial R&D and web page computer programming. --Create, operate and manage the AeroRocket e-Commerce web site. --Internet publishing using Microsoft FrontPage, Adobe Photoshop, Adobe Illustrator. --Automated several ASME Code pressure vessel design computer programs using VB-6. --Mathematical capability enhanced by Maple V, MathCAD, Theorist and Excel. John Cipolla registered the AeroCFD® trademark (number 2992220) with the United Stares Patent and Trademark Office on September 6, 2005 for the following description of Goods and Services: COMPUTER SOFTWARE THAT USES THE METHODS OF COMPUTATIONAL FLUID DYNAMICS (CFD) FOR THE PREDICTION OF MODEL ROCKET DRAG, LIFT AND MOMENT COEFFICIENTS; THIS SOFTWARE IS USED FOR DESIGNING MORE AERODYNAMICALLY EFFICIENT ROCKETS. Except as noted John Cipolla is primary investigator or sole author for the technical papers presented above. (*) John Cipolla is the main author for these technical papers. "Computational and Experimental Interferometric Analysis of a Cone-Cylinder-Flare Body"
Authorship Dispute: In an authorship dispute submitted to the AIAA ethics committee in January 2015, the American Institute of Aeronautics and Astronautics (AIAA) was requested to acknowledge John Cipolla's contribution as coauthor for the AFAL portion of the AIAA paper, AIAA-1990-0621. 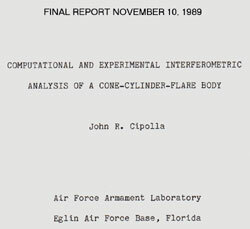 In their finding the AIAA admitted that John Cipolla’s research represents "similar work" as performed in AIAA-1990-0621, was “unique within AFAL”, and published before the January 8-11, 1990 publication date of AIAA-1990-0621. In fact, John Cipolla's final report was submitted on November 10, 1989 and included a briefing and handouts to all AFAL personnel including at least one author of AIAA-1990-0621. However, even after acknowledging as valid a signed letter from a high ranking AFAL, CFD Section supervisor who stated, "This proved to be a new and innovative method for CFD code validation methods and was reported by John et al in an AIAA conference paper", the AIAA continues to deny John Cipolla’s authorship. The AIAA also ignored signed letters from two other supervisors stating John Cipolla made significant contribution. In addition, we believe the wording and concepts expressed by the following copyright 1989 material from John Cipolla’s final report was used without permission by the AIAA and AFAL, “The ability to measure these effects and to calibrate and validate existing computational methods is essential to designing efficient high-speed vehicles and to minimize heating and ablation effects. A nonintrusive technique to measure these effects and to produce a database for comparison with CFD results is essential to remove the uncertainty of physical measurement systems”. The authors used the keyword calibrate three times and in one instance used the keyword calibrated in quotes without reference to its origin in relation to CFD/holographic technology. Conflating the terms validate and calibrate is not common practice in the aerospace industry and are not common themes in the industry when validation occurs in CFD code development and not calibration. John Cipolla's concept of calibrating CFD codes revealed during his briefings and final report appear to have been adopted without recognition in AIAA-1990-0621. In addition, even AIAA-1985-1564, the basis for AIAA-1990-0621 and the main reference for the work never once used the word “calibrate” at any point in the paper. The referenced AIAA conference paper was located using AIAA’s new ARC technical document retrieval system and was presented at the 28th Aerospace Sciences Meeting, held January 8-11, 1990 in Reno Nevada. In our opinion this type of behavior is known as “denial of authorship” and is an AIAA publication ethical violation. Please email AeroRocket to see the complete summary of AeroRocket's year long ethics investigation pertaining to the authorship dispute for AIAA-1990-0621. Visual Basic 6, FORTRAN 77/90, C++, UNIX, FLUENT & GAMBIT, MSC/NASTRAN, COSMOS/M, Excel, MathCAD, Photoshop, FrontPage, PDEase2D for differential equations and various CAD software packages.